Horned and tufted puffin photos from Alaska's coast. 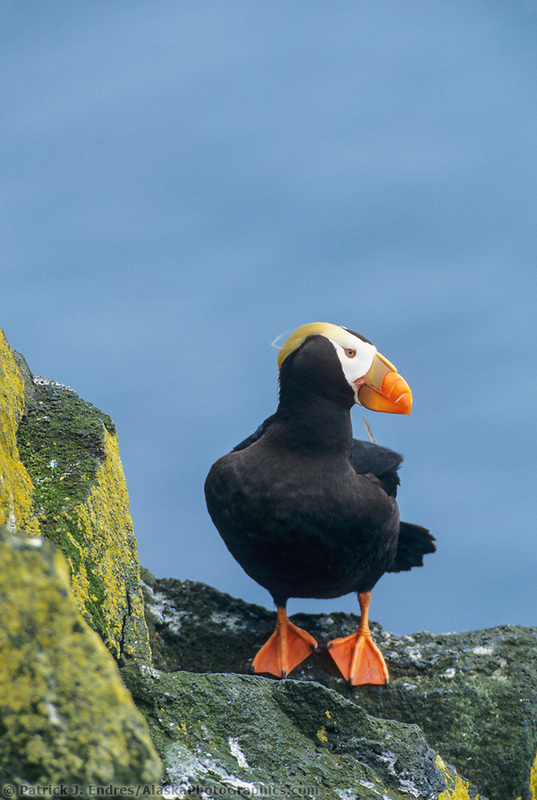 There are two types of puffins in Alaska, Horned Puffins, and Tufted Puffins. Puffins belong to the family Alcidae. Alcids spend most of their lives on the open sea and only visit land to breed in the summer. 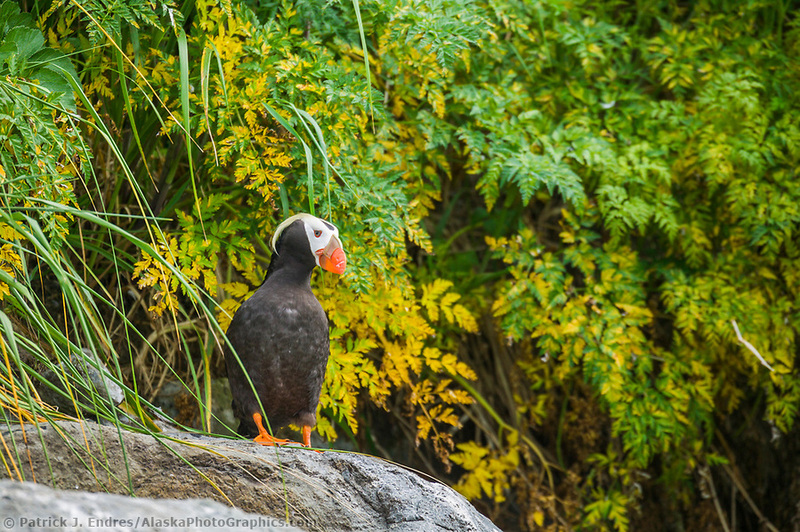 In Alaska, puffins breed on coastal islands and headlands from Forrester Island in southeastern Alaska to Cape Lisburne on the Chukchi Sea Coast. Horned Puffins are more prevalent farther north than Tufted Puffins. The most striking puffin feature is the large colorful bill. Both males and females have the same markings. 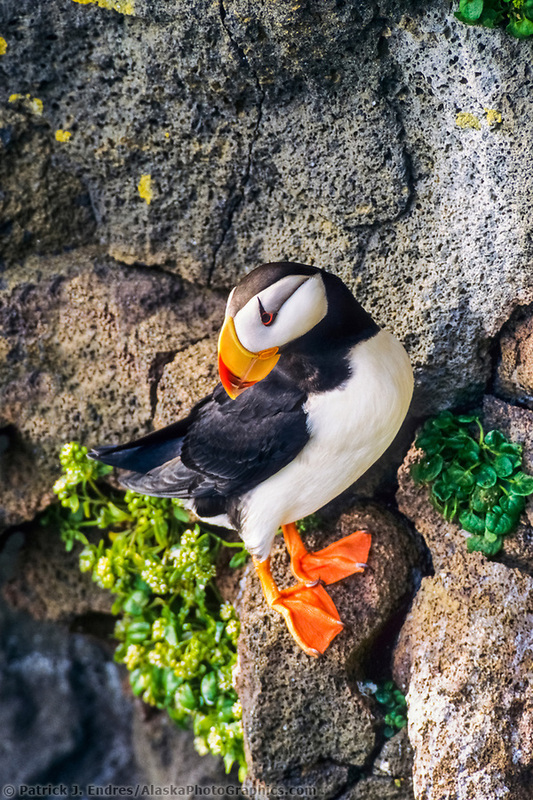 All puffin photos on this site are available for purchase as commercial stock photography or fine art pictures for home or office. They were taken on St. Paul Island of the Pribilof Islands, and in Prince William Sound. Horned puffins are the species most often depicted on souvenirs. They have a clown like look and coloring. In summer they have a distinct white breast, black neck and back. The white breast is so distinctive that in one Eskimo language puffins are called katukh-puk, meaning “big white breast.” The Horned Puffin has a small, fleshy, dark “horn” above each eye in the summer. The beak is bright yellow with a red tip. Adults are about 14 inches (36 cm) long and weigh about 1 1/4 pounds (600 gm). Tufted puffins are easily identified by the yellow tufts of feathers that curl back from each side of the head. 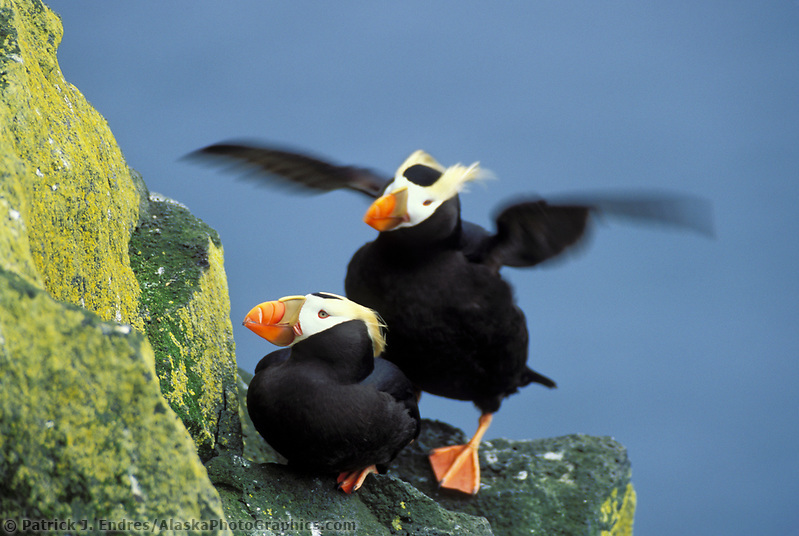 They have dark, black bodies and white faces, and they lack the big white breast of the horned puffin. They have orange feet, and their bills are red and yellow. Puffins, like many other seabirds, nest underground. They generally arrive at breeding colonies in May but arrive later in northern areas due to the lateness of spring. 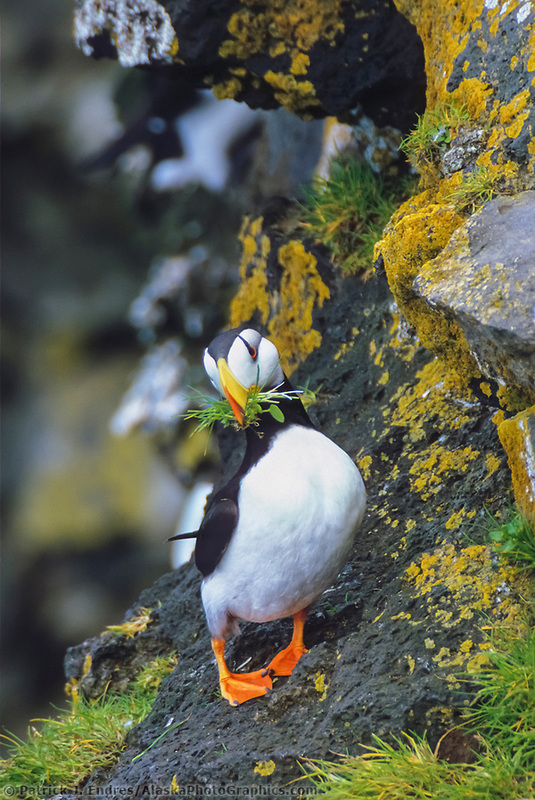 At rockier sites where the soil is scarce or nonexistent, puffins nest on rocky slopes or cliff faces. Both species lay only a single, whitish-colored egg. Most birds spend the winter far offshore in the North Pacific Ocean. Young puffins remain on the open sea during the summer of their first year. When they are 2 years old they visit the colony during the summer. Puffins can breed at 3 years but more typically at 4 years. They are stout birds built more for swimming underwater than for flying. They propel and maneuver themselves underwater with their wings and webbed feet. On land, puffins are agile, but when they fly they appear quite awkward.